Kraft paper with twine + greenery. Easy peasy. You can grab branches or leaves from your yard, or snip a little piece off your Christmas tree! DIY kid art wrapping paper. Get a roll of kraft paper, a bin of markers, and let your kiddos go to town drawing Christmas trees or stars or whatever their little hearts desire. Grandparents in particular get a kick out of this. Also a winner with the grandparents and husbands: wallet-size photos! I ordered these from mpix.com but you can also use promo code PRINTJOY at artifactuprising.com and get 25 square prints free, which would be adorable fastened to a wrapped gift. Already decorated your tree? Try making a time-lapse of baking cookies, wrapping gifts, or your whole Christmas morning! Set your phone up on a stable surface (I just lean mine against a candle on a shelf), select “time-lapse” option on your camera, and forget it’s there. If you don’t have an iPhone, here are the best time-lapse apps (for Android, too!). I’ve never had a mantle, is that odd? Every house I’ve lived in for the past 12 years (basically—all homes I’ve lived in as an adult) have been mantle-less. Solution: I design Christmas shelfies instead. Do you have a bookcase you can temporarily rearrange? Or a built-in shelf you can play with? 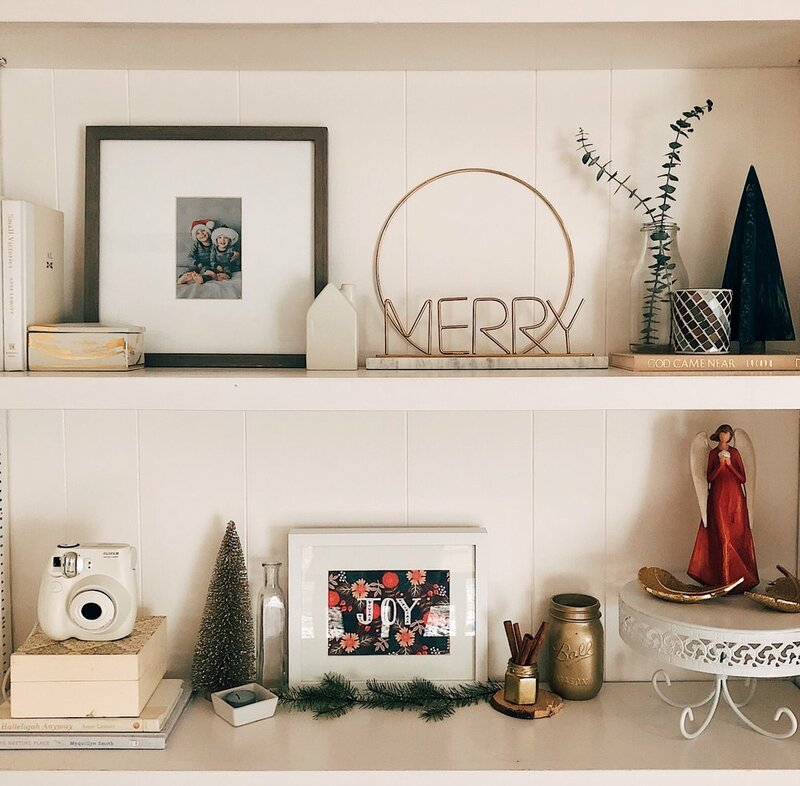 Try grabbing some of your favorite holiday decor and styling a shelf from scratch. Things you can include: a nativity set, pine scented candles, greenery, little jars of cinnamon sticks, extra ornaments that stand up on their own, framed photos from past holidays. Along with birthdays, Christmas is a perfect time of the year to mark the growth of our families! Find a picture you took last Christmas and try to re-create it in the same spot. What’s different? What’s the same? If you don’t have a good picture from last Christmas, now is a perfect time to start a new tradition. In our house, in addition to snapping a pic in front of the Christmas tree, we always take pictures of the kids in their holiday jammies wearing Santa hats. It’s the one time a year we let them jump on our bed. 6. Make a beautiful holiday card display! Our living room is a work in progress and we haven’t hung anything on the walls yet, so I’m thinking of using our blank canvas as a backdrop for a new card display! Top of my list: this DIY eucalyptus garland display. Happy creating this month, ladies! If you make anything lovely, please share a picture in the Facebook group; we’d love to see!